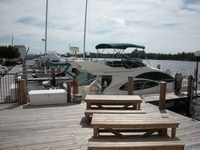 Yacht Harbour Villas Condo is located directly on the intracoastal in Hollywood Beach Florida. Hollywood Beach living is all about a life style centering around the waterfront. Yacht Harbour Villas in Hollywood, brings the waterfront home by offering docks with each unit. In addition Hollywood Beach is just a short walk from Yacht Harbour Villas. Yacht Harbour Villas Condo is a small building of just 30 condominiums units. Want a place to runaway to in the Ft. Lauderdale area, close to the beach, and close to the airport ? For many reasons, I want to bring your attention to Yacht Harbour Villas Condos in Hollywood Beach. Read more about Yacht Harbor Villas Condo in Hollywood Florida. Yacht Harbour Villas Condominium sits directly on the intracostal waterway at 3200 N Ocean Drive, Hollywood,Florida. All condominium units at the Yacht Harbour Villas Condominium come with a deeded dock that will house up to a 50 foot boat. The units feature stunning views of the intracasotal waterway and a green belt across the way. The property is only 10 mintues from Fort Lauderdale Interantional Airport. The area features the Hollywood Board Walk and the famous Hollywood Beach. All ages are welcome at this condominium and pets under 20 lbs are allowed. If you are looking for a condominium that you can bring your boat at a great price do not miss the Yacht Harbour Villas Condo. Eric Miller and Associates, are always available to help you buy or sell real estate in the area and will be happy to show you Yacht Harbour Villas Condo. You can Contact us directly at (954) 383-8170.